I was in Target last night, with my list of only two things that I needed...and of course came out of there about $200 in the hole. How is it that even with a list of only two items that should maybe total $10, I always manage to come out with a shopping cart full and a big charge on my credit card. Oh Target, how I hate and love you at the same time! 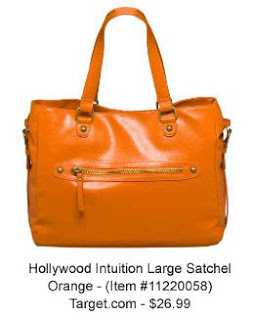 Well one of the traps I fell into was this gorgeous orange bag, directly to my right when I first walked in. It would be perfect for gamedays because it could hold everything, yet still be a size allowed into the stadium. I wish I had included it in yesterday's post, because I plan on using it as my work bag too. I also saw these jeans - right in the front of course - that I almost bought but didn't have time to try on - thinking of going back and just trying them on and seeing what they look like. 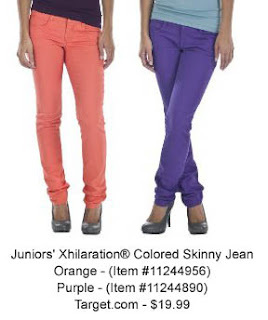 They are skinny jeans, and come in purple and orange. The orange pictured on the Web site doesn't do the jeans justice - they are more orange than the photo, literally Clemson orange. I think I would wear the orange jeans to one of the colder games, with a white sweater and my brown knee high, sweater boots over them. I guess they'd also be cute in October - the purple jeans paired with a cute orange tank and orange flats. What would you pair these purple or orange skinny jeans with?